What do to if your beach is not monitored regularly? Recreational water illnesses (RWIs) are illnesses caused by germs and chemicals found in the water where we swim or participate in other water-related activities. These illnesses are spread by swallowing or having contact with contaminated water. People who swim while they are sick with diarrhea or vomiting; a speck of their stool can contain millions of germs. Waste from animals, such as pets, geese, seagulls, and other wildlife. Sewage spills or leaky septic tanks. The most common symptoms of RWIs include diarrhea, vomiting, stomach cramps, and fever. RWIs can also cause skin, ear, eye, respiratory, or neurologic symptoms. Children, pregnant women, and people with weakened immune systems can suffer from more severe illness if infected. If you are concerned about your symptoms, contact your health care provider. 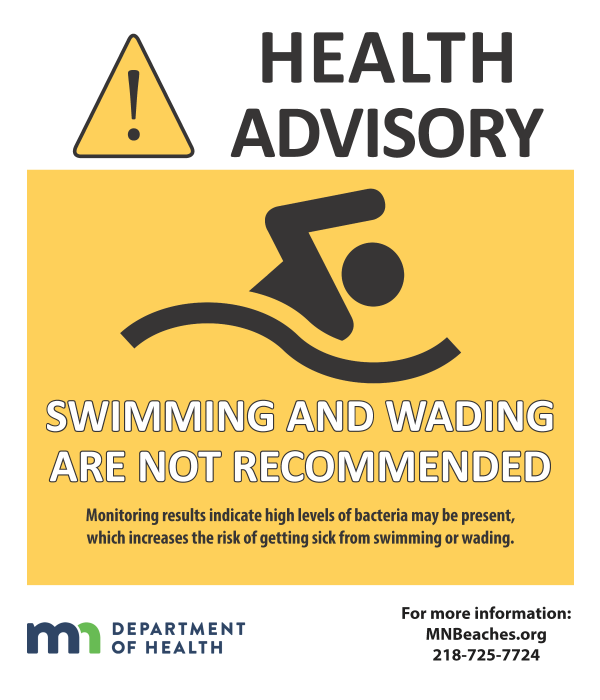 To report a suspected waterborne illness call the Minnesota Department of Health Foodborne and Waterborne Illness Hotline at 1-877-FOOD-ILL (1-877-366-3455). You may also email your illness report. MDH will relay the necessary information to the appropriate local health authorities. Swimmers at monitored beaches should look for beach advisory signs before they go in the water. If advisory signs are posted, swimming and wading are not recommended. While beach monitoring results can provide a snapshot of the water quality at the beach, water conditions can change rapidly. Swimmers at monitored and non-monitored beaches should always follow the advice below to reduce their risk of getting sick. Click here for more information about preventing recreational water illnesses. Before going to the beach, swimmers should take precautions to avoid injuries and protect themselves from the sun. The most up-to-date rip current forecast and UV index forecast for Park Point Beach are found here. CDC: How Can I Protect My Children from the Sun?